A Licensed & Accredited Healthcare Training School Offering Healthcare & Nursing Programs. 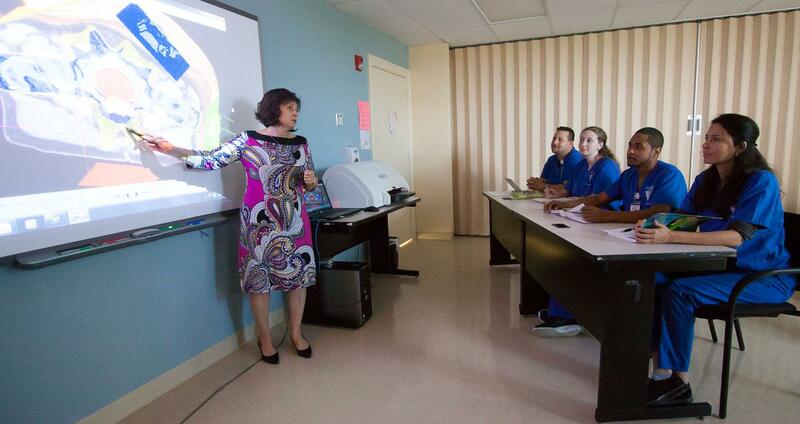 The Delray Beach campus in Palm Beach County, Florida offers courses and programs in patient care, medical assistant, electronic medical records management, nursing, diagnostic medical sonography (ultrasound), radiologic technology and radiation therapy. This nationally accredited healthcare training school has the tools, technology and experienced staff to make your dream of working as a medical professional a reality. In some cases, you could earn your healthcare or nursing degree in as little as 9 months! A Positive Job Outlook For Medical Professionals in Palm Beach County. The Bureau of Labor Statistics reports that there are currently about a half-million people employed as medical professionals in the Palm Beach County area. The average salaries for medical professionals in careers related to the courses offered at our campuses can range from $20,810 – $88,490. * While every career and employment situation is unique, overall demand is growing for workers in all positions within the healthcare industry in cities throughout Florida. Please check www.bls.gov for more information on average salaries in your prospective career choice. Delray Beach Campus in Palm Beach County, Florida: The Perfect Location & Place to Learn. Conveniently located in Palm Beach County, just minutes from breathtaking beaches, our classrooms feature a diverse student population. They come from all over Florida, including Miami, along with surrounding states. Because our class sizes are smaller than most other institutions, students can expect to receive truly personal attention as they are trained on the industry current equipment. Cambridge is also known for its externship, job placement and career services to help students jump-start their careers in the medical field. It’s 28 month, CAAHEP accredited Diagnostic Medical Sonography program that provides students an experience in both the classroom and hands-on training in industry current labs. In this 24-month degree program, students receive highly diversified instruction in radiation physics, radiation biology, anatomy, physiology, pathology and radiographic procedures through an offering of on-campus courses. This program is focused on preparing students for the clinical, theoretical, technical and psychological aspects of a career in Radiation Therapy. The Palm Beach County, Delray Campus offers this as a 24-month Associate Degree program open to students with no prior medical experience. This Practical Nursing Training program on our Delray Campus in Palm Beach County offers students basic to advanced courses in nursing theory and clinical practice. This nursing curriculum prepares students to function as critical thinkers throughout the nursing process and within the scope of practice. As a fully trained Electronic Medical Records Management specialist, you’ll have an advantage in finding employment at a variety of medical offices, medical record facilities and libraries, hospitals, clinics, insurance companies, and medical billing companies. As a fully trained Advanced Medical Assistant who can also perform basic X-Rays, you’ll have an advantage in finding employment at a variety of medical offices. After graduating and earning your diploma from this Advanced Medical Assistant and X-Ray program at Cambridge, you’ll be able to take the Basic X-Ray Machine Operator licensure exam in the state of Florida (BXMO). You’ll also be eligible to take the examinations to become a Registered Medical Assistant (RMA). In about nine months, you can be fully trained to work in a healthcare facility as a professional Patient Care Technician. At Cambridge you’ll be trained through clinical rotations along with detailed experience in medical facilities. These classes at Cambridge are unsurpassed in terms of personal attention and student preparation. The mission of all Cambridge Institute of Allied Health & Technology schools is to provide its communities with learning opportunities that enables students to attain their educational health career goals and to develop an appreciation for professionalism and lifelong learning. The Institute’s mission is supported by the application of its values of integrity, diversity, mutual respect, and genuine caring regarding individuals’ aspiration for self-actualization. Break room, reception area and ten (10) administrative offices. Don’t hesitate to contact us! We’d be happy to help.